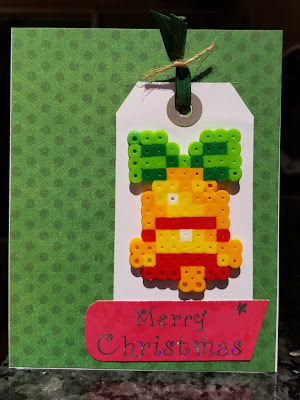 Luckily my kids LOVE *love* LOVE perler beads! The sentiment was taken from a recycled card! I also feel that it needs something more.....maybe some bling or dots of some kind, but I'll keep looking at it and make a decision! How fun that you made your very own unique bell ... absolutely love it ... so glad you helped us ring some bells at Jingle Belles. I really love this card and bonus points for creatively using stuff you have. It's funny but I also had to search for bells, and I have a lot of Christmas stamps. No bells.